The Scottish Government has granted formal consents for a £4.5Bn project to create a 1,866MW capacity offshore wind farm in the Outer Moray Firth which will be the third largest in the world. Construction work should start in 2015 on the development of adjacent windfarms in the middle of the Beatrice oil and gas field, creating up to 4,600 engineering jobs during peak construction. Two 5MW experimental turbines are already operating on the site which is some 22 kilometres offshore. The overall project comprises three adjacent offshore windfarms, the Telford, Stevenson and MacColl being developed by Moray Offshore Renewables Limited (MORL), a joint venture company owned 67% by EDP Renewables and 33% by Repsol Nuevas Energias UK; and Beatrice Offshore Wind Farm Limited (BOWL), a partnership owned 75% by SSE Renewables and 25% by Repsol Nuevas Energias UK. They will create up to 580 jobs offshore for day-to-day running once operating. The development will be capable of generating up to 1,866MW of electricity – enough to power over one million homes – from up to 326 turbines of 187 metres height. Collectively the projects are expected to be worth up to £2.5Bn to the Scottish economy. When completed the development will be bigger than the London Array, currently the world's largest offshore wind farm with 175 turbines. 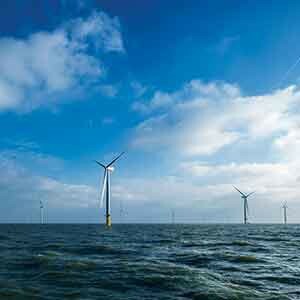 Wind farms in South Korea and Sweden are also set to overtake the London Array.